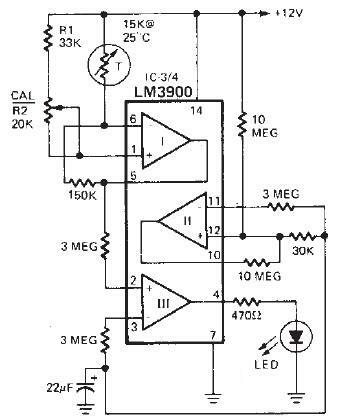 Thissimple road ice alarm electronic circuit schematic use a LM3900 quad operational amplifier. As a temperature sensor this road ice alarm circuit use a thermistor. When the temperature is around 36 degrees Fahrenheit (2.2 celsius degrees) the LED connected on pin 4 at the LM3900 op amp will flashes at once about each one second. When the temperature is going down to 32 degrees Fahrenheit (0 degrees Celsius) the led remains on. Before you use this road ice alarm electronic circuit you need to calibrate it. To calibrate the circuit you need to put the thermistor in a mixture of a crushed ice and water and adjust the variable resistor R2 until the LED is remaining on. The road ice alarm circuit needs to be powered from a 12 volts DC power supply circuit ( If you use it for car the car battery can be used for powering the circuit ).